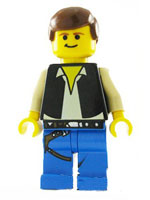 Han Solo is a Star Wars minifigure first introduced in 2000. 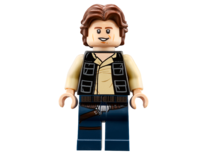 Since then, a total of seventeen versions of the minifigure have been made, along with two different pieces representing Han frozen in carbonite, and one microfigure for the LEGO Games theme. He is also a playable character in five video games to date. Three variants of Han Solo were released in 2000. In the 7190 Millennium Falcon, Han has a blue leg piece, with black silver and brown printing on the top of the hip joint representing a belt, which continues down the right leg for a blaster holster. The front of the torso piece has a white open-necked shirt and a black sleeveless jacket printed on it, with black also used for outlining. The hands and head piece are yellow for skin, and printed on the head piece is are black two dot-eyes, brown eyebrows and a black mouth shaped into a lopsided smile. A common hairpiece is used for Han's hair, coloured brown. 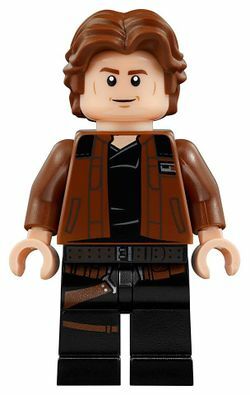 The first Han Solo variant to have flesh-coloured skin. For 2010, Han's head piece received it's first major update since the original design pattern. The eyes were changed to have white irises, and the right eyebrow was turned down slightly more than the left. The mouth was also changed, instead of being made up of lines, it was changed to one, but still depicting a lopsided smile. Darker flesh printing is also used beneath the mouth for extra detail. Two versions of Han were released in this year. One of these is yet another Hoth variant, but the torso features an open dark blue jacket with pockets printed on it in black, and a white shirt and skin showing underneath. 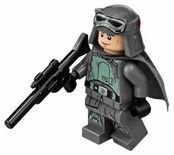 The legs are brown (with the belt and holster pattern), and he comes armed with a blaster. 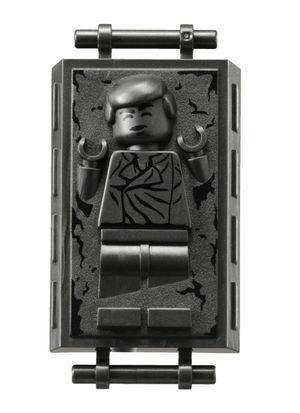 The other variant for 2010 is the third incarnation of a minifigure depicting Han in the clothing around the time of being put into carbonite, included in the set 8097 Slave I. This variant once again has plain brown legs, but the torso printing was altered to provide more detail. Black printing is once again used for outlining the shirt, but grey printing is also used to symbolise creases. Flesh printing is also used at the top of the piece for skin, and dark flesh for detailing in this area. 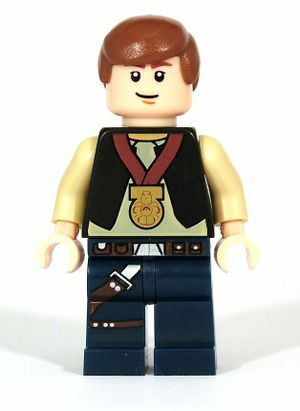 An exclusive Han Solo minifigure was released in the 5000214 LEGO Star Wars Character Encyclopedia, based Han after he received the Medal of Bravery after helping to destroy the first Death Star. This minifigure was similar to the one released in the 2011 Falcon, but it had the Medal of Bravery printed in gold with a brown ribbon and black outlining. The jacket was also slightly altered, with not falling so far down, and the shirt collar was changed to be higher, reflecting the ceremonial attire Han wore to the awards ceremony. Another Hoth version of Han will appear in the 2013 "May the Fourth" promotion. It will feature Han with interchangeable hair and a light brown hood, with brown clothing. The head piece will be double-sided, one showing Han with goggles and the lower half of his face covered up, and the other depicting Han with a grimace. 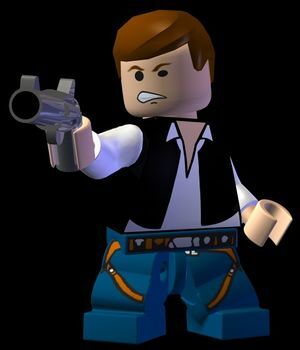 In LEGO Star Wars II: The Original Trilogy, three Han Solo characters were made. 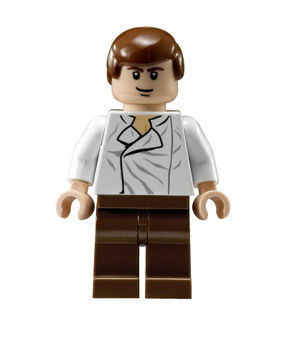 "Han Solo" is based upon Han's 2004 minifigure with dark blue legs, and white shirt with black jacket. This character is armed with a grey gun piece, commonly used as a revolver. "Han Solo (Hoth)" is also armed with this gun, and is similar in appearance to the Hoth variant released in physical form four years later, with an open blue jacket and brown legs. "Han Solo (Endor)" is the same as "Han Solo" in every way, except he wears a green camouflage cloak over his jacket. "Han Solo (Skiff)" is also armed with a grey pistol, and his appearance is based upon the first variants featuring Solo as he came out of carbonite. "Han Solo (Stormtrooper)" features Han in Stormtrooper armour, much like the stormtrooper diguise variant released in 2008. This version of Han comes armed with a megaphone that has a transparent orange stud on the end, representing what was used for guns in the Star Wars theme prior to 2007. In the game, all three characters have the ability to shoot, grapple and build objects. Also playable by turning on extra toggle is "Han Solo (frozen in carbonite)", which is based upon the original carbonite block. This character has no abilites and is unable to attack- it is simply able to move by hopping around. These characters all returned for LEGO Star Wars: The Complete Saga with the same abilities and weapons. Han Solo was a smuggler, pilot of the Millennium Falcon, and a good friend of Chewbacca. At one point, Solo was in debt to Jabba the Hutt, and in desperation Solo accepted 17,000 credits for transporting Ben Kenobi, Luke Skywalker, C-3PO and R2-D2 to Alderaan on their quest to help Princess Leia. When they arrived, Alderaan had been destroyed by the Death Star's superlaser and the Millennium Falcon was captured by the Galactic Empire. Inside the Death Star, Han Chewbacca and Luke Skywalker managed to avoid notice by security, and rescue Princess Leia from the Empire. Prior to their escape, they noticed Ben Kenobi dueling with Darth Vader, resulting the physical death of Ben Kenobi. After escaping the Death Star, they proceeded to the Rebel Base on Yavin IV, where Solo realised the the Rebel's plan to attack the Death Star was a "suicide". However, Solo soon had a change of heart, and returned to aid in the attack. The result was the destruction of the First Death Star. After this, Han accepts a position as general with the Rebel Alliance. When the secret Rebel Base on the planet of Hoth was discovered by the Empire, Han, Chewbacca, C-3PO, R2-D2, and Princess Leia escaped in the Millenium Falcon, but were pursued by several Imperial Star Destroyers after realisation that the hyperdrive aboard the Falcon was malfunctioning. After shaking the Imperial pursuit, Han went to Cloud City for repairs for the Millenium Falcon. There, Han meets his old friend and former owner of the Millennium Falcon, Lando Calrissian. But what Han doesn't know is that he was being tracked by the legendary bounty hunter Boba Fett by orders of Darth Vader, that there is a detachment of Imperial Stormtroopers on Cloud City, and that Calrissian, the administrator of Cloud City, was threatened into setting a trap for Solo. After being captured, Princess Leia and Han confess their mutual love. Darth Vader froze Han in carbonite but the reals intention of Darth Vader was to cause a disturbance in the Force, knowing that Luke Skywalker would come to his friends' aid. Unfortunately, Han's frozen body was taken away before his friends could save him by Boba Fett in the Slave I to Jabba the Hutt on Tatooine. On Tatooine, Princess Leia, Lando Calrissian and Chewbacca made a plan to infiltrate Jabba's Palace and rescue Han, but after Han was unfrozen from the carbonite, Jabba the Hutt discovered them. However, they did have a second plan formulated with the now Jedi Knight Luke Skywalker, and they managed to escape. Later Han, Chewbacca, C-3PO, R2-D2, Princess Leia, Lando Calrissian and later Luke Skywalker reunite with the Rebel Alliance. Han leads a covert mission on the Forest Moon of Endor to deactivate the shield generator of the Second Death Star, where Han and the other members of the Rebel assault force destroyed the shield bunker, allowing the destruction of the Second Death Star by the Rebellion's Star Fleet. As a boy, Han escaped from an orphanage in LEGO Star Wars: The Padawan Menace, and assisted Jedi Master Yoda in a mission for the Jedi. His name was revealed at the end of the film, when he fixed the letters he hastily placed on his shirt as a nametag, rotating the "I" to an "H". Some time later, Han, Chewbacca, Lando and C-3PO were in the Millennium Falcon, where they encountered Emmet, Wyldstyle and Batman. Believing Batman wanted to join their party, they invited him aboard, but instead Batman stole the Falcon's hyperdrive so they could use it for their own ship. Han Solo is played by Harrison Ford, who also played Indiana Jones. This fact has been used as the source of several jokes in various movies and video games produced by the LEGO Group. 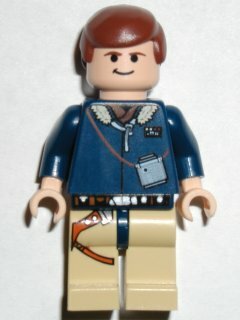 The fact that Indiana Jones (Minifigure) is a playable character in LEGO Star Wars: The Complete Saga is a reference to this. In LEGO Star Wars: The Complete Saga, he has two holsters, whereas he actually only has one. This page was last edited on 8 March 2018, at 02:53.